This is the Kansas City Breakfast Blend brought to you by Parisi Artisan Coffee. 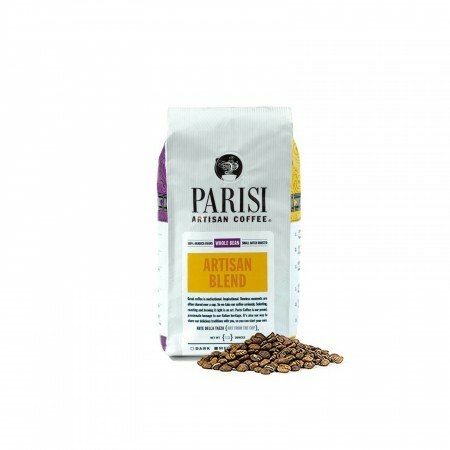 All of Parisi's decaf coffees are water-processed only, meaning decaffeinated naturally without the use of synthetic chemicals. A pleasing finish and medium acidity make it a great morning complement any day of the week. This cup is well balanced, with notes of chocolate and caramel. Middle of the road excellent. Nothing outstanding but it is a very tasty coffee. Nice blend. Wish the package would give info on country of origin though. It was great, a little too fruity for my taste though. I don't really like chocolate flavors as the main flavor in my coffee, so this is just ok. I tend to like fruitier or herbal flavors. It's also very simple, and in a way is a bit boring. While this coffee is balanced it lacks the boldness I was hoping for. There was little aroma from the crema. Everyone who tried it liked it but I want something bolder. Now that I've been paying attention to the flavors that entice my palate, I have to admit my taste in coffee has changed from several years ago. I had just assumed it would be the same, but I'm finding myself consistently loving "chocolate", "nutty", "caramel" and even lightly roasted coffees. Definitely not enjoying the floral or herby flavors anymore and I've realized I don't have as strong a preference for dark roasts... as long as it's a good balanced bean it can be anyone on the light to dark spectrum. This coffee has a great nose, like a perfect medium roast. But I get a lot of grapefruit flavor, which makes it great until the finish,which tastes sour. The overall drinking experience is tough to separate from the off-putting finish. This was a very good coffee. I found it to be very smooth and was pleased with the roast level. I made it both in my french press, as well as in a Keurig maker (I had ground some ahead of time for those rushed mornings). In the french press I got more of the acidity and initially found it to be just a bit too much (too tart?). Overall I am really enjoying this coffee. I did not care for this at all. Sorry. This is one of the most enjoyable coffees I have ever tasted. Simply delicious!! Good solid coffee, but not quite as good as the Monte Carlo or the Ceremony Roasters blends.